In my opinion both of the two main presidential candidates have overall poor economic plans. But at least several major Democratic figures such as Hillary Clinton, the NYT columnist Thomas Friedman, and the economist Larry Summers do understand the importance of economic growth. More growth means more employment. For each 1 point increase in adult male employment, the employment of young black men rises by 7%. More growth reduces the need for desperation monetary policies that risk future financial stability. If U.S. growth continues to have a 2% ceiling, it is doubtful if we will achieve any of our major national objectives. If we can boost growth to 3%, interest rates will normalize, middle-class wages will rise faster than inflation, debt burdens will continue to melt away and the power of the American example will be greatly enhanced. The question is not whether business success is desirable. The question is how it can be achieved. Our national debt is huge and growing way too fast. 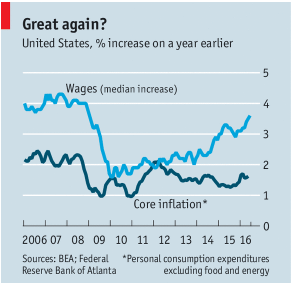 Wages are now increasing fairly rapidly which increases demand by itself. Investment in new business structures, equipment and intellectual property has now fallen for three quarters in a row. Conclusion. 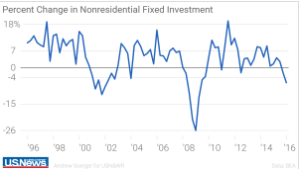 The way to achieve the faster rate of growth which Mr. Summers (and almost everyone else) wants is not more public investment but rather more private investment. The House Republicans have a plan to accomplish exactly this. This entry was posted in A Better Way, Better Way, economic growth, Hillary Clinton, House Republicans, investment, Jack Heidel, Larry Summers, Thomas Friedman, wages, Washington Post and tagged A Better Way, debt, economic growth, Hillary Clinton, House Republicans, jack heidel, Larry Summers, tax reform, Thomas Friedman by jackheidel. Bookmark the permalink.